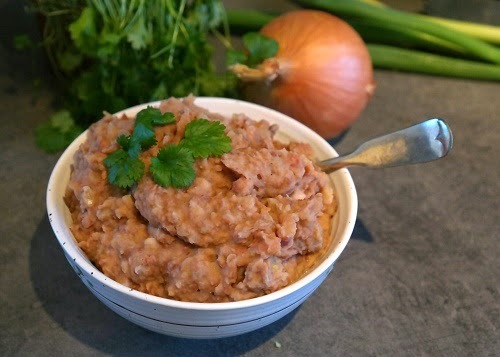 Refried beans are Mexico’s equivalent to mashed potatoes and it is made of pinto beans. The actual name is frijoles refritos meaning well fried beans. The Anglo name suggests that these beans are fried, but that’s not the case. There are many different ways to make refried beans and you can use most kinds of beans, but in traditional Tex-Mex pinto beans are used. 800 g of cooked pinto beans or the kind you want to use. Saute the onions in oil on medium heat until it is tender and add the garlic and chili powder. crush this in a blender with the liquid. Pour this back into the saucepan and add the beans and boil until the beans are warmed through. about 5 minutes. 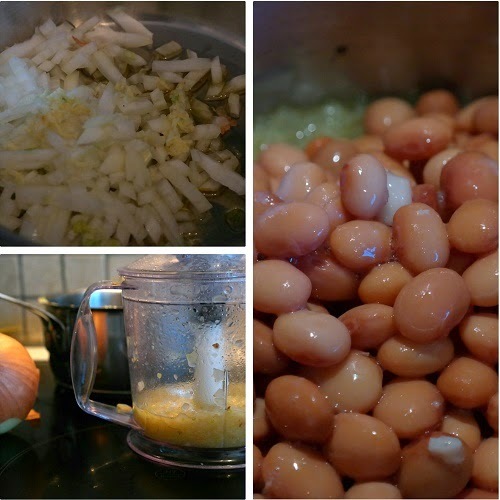 Mash beans with a spoon, salt and pepper as desired. You can also add chopped fresh coriander if you desire. Serve this bean puree with your favorite Tex-Mex, taco, burito, Chimmichanga, tostada, quesedilla etc.